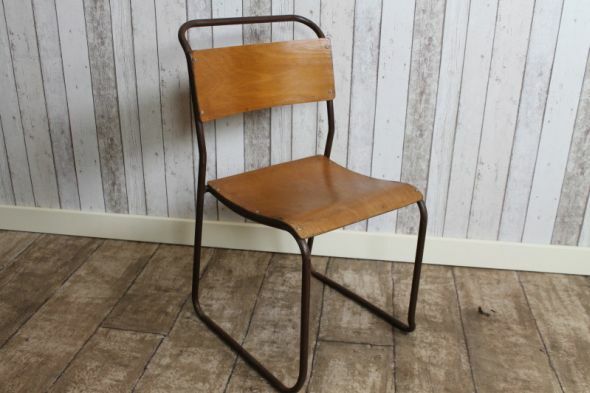 These vintage original industrial old stacking stacking chairs are one of our large range of stacking chairs that we currently have for sale; ideal for any retro interior, restaurant, cafe etc. A classic design from the 1950s, this chair is being sold individually, but we do have more available. Please note – this price is for one of our vintage retro old stacking chairs. These vintage retro chairs are extremely sturdy, and are ideal for any vintage industrial interior. The chairs are in good condition for their age; circa 1950. The frames show rust, however, this does not detract from the great vintage appearance of these vintage old stacking chairs. We stock a large range of various metal stacking chairs. Please see our other listings or contact us for more details.